This thing I’m working on is a strange hybrid: Part 2 of “the one that won’t end” with what I had of “the one that won’t go” tacked on to it because there seemed no obvious divide. It works, sort of, but now I’m suddenly at that stage of first draft where I can’t keep track of the story any more. At least, after plot-noodling with two different friends, I know who my villains are and what they’re up to (no good, I solemnly swear!) and I also know that several things have to happen for the plot to go where I want it to go, and even what some of them are, but I had no clear overview. What I needed was an outline. I’ve never been good at outlines. Outlining before writing kills any incentive to write, unless I outline in a different language than the actual story. I haven’t tried this for novels yet. but it works for roleplaying writeups (we play in Dutch so my notes are in Dutch, I write it up in English for Valdyis galsin). I also have a tiny notebook that I make bilingual notes in, and until now that’s worked for one new and as yet unfinished short story (starting to write that unblocked me so I put it aside and got editing) and the next part of my space opera thing. Outlining after writing, as running text, makes me painfully aware that everything I’ve written is rubbish. 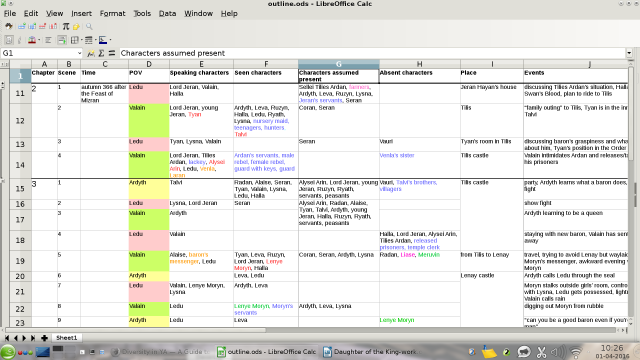 Then, late last night, when I was thinking vaguely of going to bed, I suddenly had an idea of how to outline in a spreadsheet. I was at it from 11.30 to 1.30, and again when I got up this morning, so much that I forgot that it was time to go swimming. One thing I immediately saw was that Chapter 2 is very short and Chapter 3 is so much its continuation that I’ll probably merge them. In fact, I didn’t even notice the “Chapter 3” heading while entering scenes. I won’t do any rechaptering until I’ve entered all I’ve got, though. The POV column has conditional formatting: entering a name gives the right background colour. Strangely, LibreOffice Calc didn’t allow me to edit styles once I had them: probably a bug. I’ll try to find and fix it in the rc file, because I accidentally gave Vauri the wrong shade of blue background and it annoys me every time she has POV. Also, I made styles called Untitled1 and Untitled2 (vexingly, Untitled2 does have the right shade of blue) before I got the hang of it, that I can’t delete because the style dialog refuses to appear. I have text colours for “first appearance“, “one scene but speaking“, “first mention, will appear later“, “deceased” and “extras“. I had “mentioned only” but merged that with extras because most people who were only mentioned were indeed that, unless they were dead. If someone dies after having been alive (yes, I know that happens to everybody, but I mean in the story) I can bring them up in red, default black, and green, as you can see happening to Lenye Moryn in three consecutive scenes. This is much more useful for me than the attendance manager in Plume Creator which doesn’t allow for characters changing status in the course of the narrative. I may add a colour-coded column to track which scenes serve what purpose (story, character, background; and/or “friendship”, “Valain’s kingship”, “Ardyth’s development”, “beating the villains”) but that’s for later, if it turns out that I need it. I thought this up after I’d gone to bed and was trying to worry about writing instead of the thing I was pointlessly worrying about, but fell asleep before I could get up and do it. I also have a spreadsheet called “attendance.ods” in which I track characters’ age, gender and sexual preference, with a formula to calculate everybody’s age in the current year, but I haven’t put any effort into tracking whether people are born after the current year, or die before it, so when I change the reference year I get weird ages. I may put it in the outline document as a separate sheet.